37th day of the year with 328 days to follow (329 in leap years). 1778 The Treaty of Alliance and the Treaty of Amity and Commerce are signed in France by the United States and France signaling official recognition of the new republic. 1820 The American Colonization Society sponsored a settlement in present-day Liberia with the first 86 African American immigrants. 1843 The first minstrel show in the United States, The Virginia Minstrels, opens (Bowery Amphitheatre in New York City). 1862 The U.S. Navy gives the Union its first victory of the American Civil War, capturing Fort Henry, Tennessee, in the Battle of Fort Henry. 1899 The Treaty of Paris, a peace treaty between the United States and Spain to end the Spanish-American War, is ratified by the United States Senate. 1933 The 20th Amendment to the United States Constitution, establishing the beginning and ending of the terms of the elected federal offices, goes into effect. 1951 A Pennsylvania Railroad passenger train, The Broker, derails near Woodbridge Township, New Jersey. The accident kills 85 people and injures over 500 more. The wreck is one of the worst rail disasters in American history. 1959 The first patent for an integrated circuit is filed by Jack Kilby of Texas Instruments. 1996 Floods in the Willamette Valley of Oregon, United States, causes over $500 million in property damage throughout the Pacific Northwest. 2018 SpaceX’s Falcon Heavy, a super heavy launch vehicle, makes its maiden flight. Cats do what they want. They rarely listen to you. They’re totally unpredictable. When you want to play, they want to be alone. When you want to be alone, they want to play. They expect you to cater to their every whim. They’re moody. They leave hair everywhere. Dogs spend all day sprawled on the most comfortable piece of furniture in the house. They can hear a package of food opening half a block away, but don’t hear you when you’re in the next room. They can look dumb and lovable at the same time. They growl when they are not happy. When you want to play, they want to play. When you want to be alone, they want to play. They leave their toys everywhere. They do disgusting things with their mouths and then try to give you a kiss. I’ve never understood why women love cats. Cats are independent, they don’t listen, they don’t come in when you call, they like to stay out all night, and when they’re home they like to be left alone and sleep. For their anniversary, a couple went out for a romantic dinner. Their teenage daughters said they would fix a dessert and leave it waiting. Everyone knows I’m a stickler for good spelling. So, when an associate e-mailed technical documents asking me to “decifer” them, I had to set him straight. At our family picnic, my mother insisted that I had to wash my hands before eating. I protested that they weren’t dirty and that the rest rooms were far away, but Mother prevailed (as they always do) and I went and washed up. Later, as I was standing with a full plate of food, my hamburger slid off the plate and onto the grass. Understandably distressed, I said, “Mo-o-om!” and started to tear up. While browsing in a Christian bookstore one day, I discovered a shelf of reduced price clearance items. Among the gifts was a lovely little figurine of a man and woman, their heads tilted toward one another. “Happy 10th Anniversary” read the inscription. I went to a VA hospital for a heart bypass operation and discovered that my surgeon’s name was Dr. Eror. “What a name for a doctor,” I said. 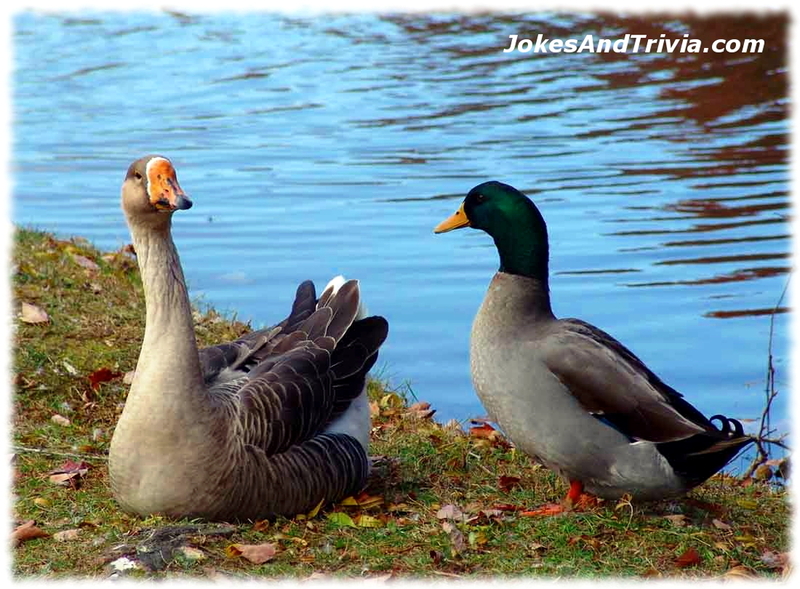 TODAY IN TRIVIA: Since its Lame Duck Day, let’s talk about ducks. ~ A baby duck is called a duckling, and an adult male is a drake. ~ An adult female duck is called a hen or a duck, and a group of ducks can be called a raft, team or paddling. ~ All ducks have highly waterproof feathers that even when the duck dives underwater, its downy under layer of feathers will stay completely dry. ~ Most duck species are monogamous for a breeding season but they do not mate for life. ~ There are more than 40 breeds of domestic duck. The white Pekin duck (also called the Long Island duck) is the most common variety raised for eggs and meat. ~ The two most famous fictional ducks are Disney’s Donald Duck, who premiered in 1934, and Warner Bros.’ Daffy Duck, who premiered in 1937. QUIP OF THE DAY: There are no rules here – we’re trying to accomplish something – Thomas A. Edison.